The anti-immigration and anti-Islam rhetoric of Alternative for Germany (AfD) has gained traction during the country’s refugee influx. 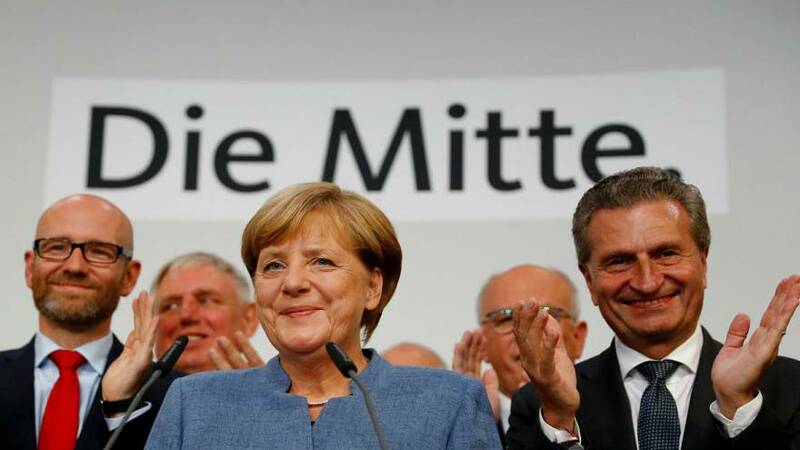 Now they have burst onto the political mainstream by securing around 13 percent of the vote and an historic place in Germany’s parliament, the Bundestag. They begun in 2013 as a eurosceptic party but shifted to the right after Angela Merkel let around a million migrants into Germany two years ago. The success of the far-right party will have, for many – especially protesters who gathered outside AfD’s headquarters on Sunday -, raised uncomfortable parallels and memories of Germany’s Nazi past. Merkel’s CDU/CSU bloc has ruled out going into coalition with AfD but, as the third largest party in parliament, they will not be without a voice. It’s been a bittersweet night for Angela Merkel. She’s won a fourth-term as German chancellor but her party has seen its vote-share plunge as AfD’s hit historic highs. Many commentators have pointed to her 2015 decision to let around one million migrants as a key turning point in her popularity. But Sunday’s election has shown she has survived to win another term – albeit with a likely hostile right-wing party in parliament. Merkel toughened her stance on migrants on the campaign trail and hinted in the aftermath of her victory the far-right party could influence her future policies. She said a detailed analysis of the AfD would need to be done and that her party must listen to and solve the problems of the people who voted for them. “We are the strongest party, we have the mandate to build the next government – and there cannot be a coalition government built against us,” she added. After shock election results last year, from the Brexit vote to the election of US President Donald Trump, leaders of Europe’s establishment have looked to Merkel to rally the liberal Western order. But after acting as an anchor of stability in Europe and beyond, she now faces an unstable situation at home as she must now form a coalition, an arduous process that could take months. Immediately after the release of exit polls, the deputy party leader of the Social Democrats (SPD), junior partners in a “grand coalition” with Merkel’s conservatives for the last four years, said her party would now go into opposition. Without the SPD, Merkel’s only straightforward path to a majority in parliament would be a three-way tie-up with the liberal Free Democrats (FDP) and the Greens, known as a “Jamaica” coalition because the black, yellow and green colours of the three parties match the Jamaican flag. Such an arrangement is untested at the national level in Germany and widely seen as inherently unstable. Both the FDP and the Greens have played down the prospect of a three-way coalition, but neither won enough seats on Sunday to give Merkel a majority on its own. It’s also unlikely to be good for Europhiles. Merkel’s weaker position at home means she could be forced to rein in plans to re-shape Europe with France’s pro-EU leader Emmanuel Macron and would have less leeway to lead the continent in areas such as immigration. Macron ran for the French presidency on a pledge to “relaunch” Europe, in tandem with Germany, after years of economic and financial crisis and the new shock dealt by Britain’s vote last year to leave the bloc. He is due to flesh out his ideas in a speech at the Sorbonne University in Paris on Tuesday. Macron has called for a finance minister and budget for the single currency bloc, ideas that Merkel has tentatively supported even though scepticism in her own party runs high. But with the FDP as a partner and the AfD pushing back loudly in parliament, the prospect of selling deeper European integration to her new coalition and the wider public looks far more challenging. Merkel’s CDU/CSU bloc and the Social Democrats have been the two dominant pillars of German politics for years. The two parties have successfully managed to represent people on both the right and left of politics in the country. Fifteen years ago they hoovered up more than 80 percent of the votes; this year they have only just managed to breach the 50 percent mark. German politics is fragmenting and one of the reasons is the country’s migrants crisis, which has seen the rise of AfD. The right-wing party gained around 13.5 percent of the vote and while CDU/CSU and SPD are still the two biggest entities, their power is much reduced. Merkel’s bloc lost around nine percent of its share of the vote, compared with 2013, while the SPD dropped five percent. This is how parties’ share of the vote has changed over the last 30 years. Syrian refugees rejoiced on Sunday at the news that Angela Merkel had secured a fourth term as German chancellor, but said they were alarmed by the rise of the far-right AfD party, which they feared could push her to tighten asylum rules. While Merkel’s conservative bloc won most seats in parliament, the result was its worst since 1949 as voters turned en masse to smaller parties. The conservatives bled support to the anti-immigrant Alternative for Germany (AfD), which entered parliament for the first time as the third-biggest party, cashing in on anger at Merkel’s decision to welcome more than 1.3 million refugees. Fatima and Ayman found out the election results from their 14-year-old son Zayd, who tuned in to the public broadcaster ZDF on his mobile phone to break the news to his parents and their friends as exit polls came in. The Syrian refugees were having dinner at Al Dimashqi, a popular Arab restaurant on Sonnenallee, a long boulevard in Berlin’s poor neighbourhood of Neukoelln that refugees call “Arab Street” for its abundance of Arabic shop signs. The AfD’s campaign appealed unashamedly to voters who feel that the influx of mainly Muslim migrants will undermine German culture, asserting that Islamic customs have no place in Germany. Merkel’s conservatives and their Social Democrat coalition partners in the outgoing government quietly introduced stricter asylum rules last year after losing support to the AfD in regional elections. Refugees fear that the AfD’s stunning showing of more than 13 percent of the vote on Sunday could spell even tougher immigration rules under the next Merkel-led government.